Situated in a park-like setting this Homer vacation rental offers free Wi-Fi and panoramic mountain views. Alaska Islands & Ocean Visitor Center is 4 miles away. A cable satellite TV and a seating area are featured in the suite at A Memorable Experience. This 3 bedroom home includes full kitchen and kitchenette complete with utensils and a dining area where guests can enjoy a meal. 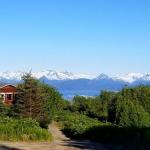 The deck provides magnificent views of Kachemak Bay and the mountains beyond. Guests of A Memorable Experience have full access to BBQ facilities and a childrenâ? 's playground. A guest launderette is located on-site. Homer Chamber of Commerce Visitor Information Center is 10 minutesâ?? drive away from this vacation rental. Center for Alaskan Coastal Studies is 13 minutesâ?? drive away. The Homer Spit is 15 minutes' drive away.